You are currently browsing the Mark's Investment Strategies Blog blog archives for May, 2018. I thought it was a good time to have a discussion about what is happening in the market and where we are going from here. In the graph above, the large image in the middle with the two blue lines is the price graph of the S&P 500 Index (my proxy for the entire stock market). If you look at the blue arrow I’ve drawn, you can see that we had a breakout above the downtrend line that traded above the R1 resistance line for a couple of days, then fell to retest the downtrend line (you can barely see the red tail thave came down to the downtrend. After a bit of back and forth over a few days, we have closed slightly above R1 resistance again. IF we are able to stay above this resistance for three days, then in my investment world we have broken out and should move up to R2 resistance, and then if we successfully hold that level, make an assault on the all time high we saw back in January. You will note that there are lots of “ifs” in that paragraph. The reality is that no one knows exactly what the stock market will do – the various support and resistance level, trend lines, moving averages, and other indicators all play a role in helping us to make some educated assumptions. But there is never any certainty in the market. 1. Look at the Orange Arrow. It is point to the Money Flow indicator – which shows the indicator in positive territory and moving higher (albeit slowly). This is a good thing, when this indicator is in positive territory that mean investors are committing money to the stock market and that is supportive of higher prices. 2. Look at the Purple Arrow. It is pointing to the Price Momentum indicator. The black line is above the red line, both are pointed upward, the black line is pointing further upward than the red line, and both are above the 0.0 indicator line. This tells us that prices are once again in a rising trend and that they are gaining in velocity in their move upward. 3. Look at the Red Arrow. It is pointing to a Line Graph with various moving averages that give you an idea of the Trend. One of the simplest things to know about the stock market is when it is moving higher, it tends to continue to move higher – and visa versa. This is a pretty graph if you are an investor, one you would grade as a “B” maybe. Ideally, for an “A” rated graph, you would have the black price line above all of the moving averages, with the moving averages all in order: 50-day, 100-day, 200-day, and 250-day. You will see that the blue 50-day moving average is below the 100-day moving average – its not ideal, but it is far from a deal killer. You can see that the black price line is in a nice trend above the 100-day moving average – but the blue 50-day line is still pointed downward. What you want to watch for is the blue line starting to turn upward – that will give you some confidence that we have a chance to retake the old highs made in January. So, where do we go from here? 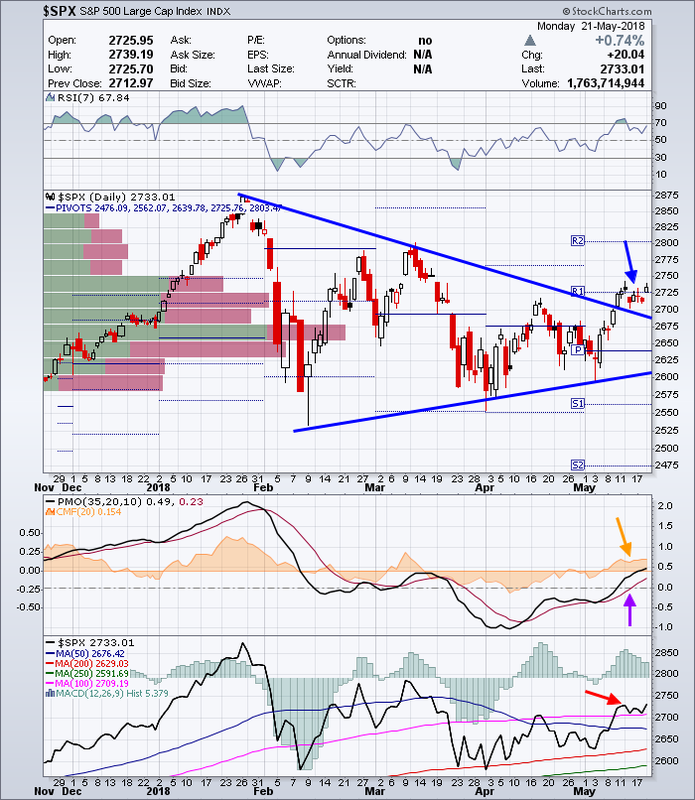 I’d say that based upon the positive readings from our indicators and the positive reading from our trend graph, I’d say the odds favor us continuing to move higher over near-term to test out the R2 resistance at 2803, or a roughly 2.5% move higher. Then we need to check our indicators and trend again. 1. Lets give this scenario of a move to 2803 a 60% chance of happening and a move back to the downtrend line at 2675 a 40% chance. 2. I’ll feel better in a couple of days if we can hold above the R1 resistance level. If we do, then I’d move our odds up to 75% of reaching 2803 and 25% of dropping to 2675. 3. If the 50-day moving average crosses above the 100-day moving average, I’ll move our odd up to 85/15. 4. If the price line remains above the 50-day and above the 100-day, then I’d move the odds to 95/5. As usual, anything can happen in the stock market – we are always one tweet away from a 3% drop in the market as investors get spooked by something that may or may not come to pass. If that happens, then we have to check our indicators and trend to see what sort of damage was done and come back with a new look at where do we go from here.